Train once a week or up to three times a week. N.B. You must be over 18 to train. You're welcome to watch as many of our Aikido training sessions as you like and try a taster session - all free of charge and without commitment, before joining the Aikido club. Whilst at the dojo, you can also ask the instructors any questions you may have or talk to the other students before or after training. Once you decide you want to start Aikido, you're invited to join our Aikido Foundations Course, which gives you a structured introduction to Aikido. The Aikido Foundations Course runs on your choice of Sunday or Thursday and has no specific start date, it starts when you join and runs for eight weeks. Please phone or email us if you have any questions or for more details about the Aikido Foundations Course. 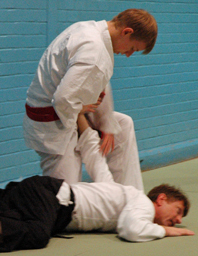 Beginners to Aikido are very welcome at our Caversham dojo. We run the same Foundations Course as at the YMCA, so you can start whenever you want. Come along and watch a training session or come and try it for yourself at a free taster session, then when you're sure that Aikido is the right martial art for you, sign up for the eight-week beginners' course. Please phone or email us for more details or if you have any questions. Please contact us before your visit or you may be unable to train. 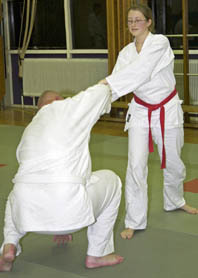 Due to the insurance requirements of the British Aikido Board, you will need show that you have insurance suitable for this martial art in order to join a session. If you are a member of the British Aikido Board, please bring your current insurance certificate. If you are a UK resident, we may be able to insure you for your session, please contact us for details. If you are visiting from outside the UK, you will need to bring proof of insurance in English. Membership of White Oak Aikido is open to anyone over the age of 18 - further details of membership are available from the White Oak Aikido Administrator. White Oak Aikido training sessions are on Sundays and Thursdays at the YMCA, Parkside Road, Reading and at the Caversham Heights Methodist Church Hall on Tuesdays. Training sessions cost £7.50 per individual session or there is a monthly standing order scheme, which makes it much cheaper (about £3.80 a session, if you train frequently). We also offer discounted training for Reading University students. Info for Beginners at White Oak Aikido Reading - some more details about the Aikido club and what to expect if you come along.